Luk yee occurs wild in Thailand, Malaysia and some other parts of the South East Asia. 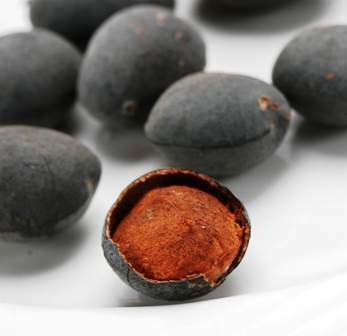 The flavour of this fruit resembles that of tamarind. That is why it is also called velvet tamarind. A medium to very tall evergreen tree. Leaves, pinnate with 3-9 coriaceous leaflets arranged alternately. Flowers small, white, borne on large terminal panicles, calyx-tubes short, with lanceolated lobes; petals absent, stamen 2, anthers attached near the base; vary sessile, two-ovuled. Pods oblong or ovoid and globose with a black pericarp; endocarp pithy and sweet. Luk yee fruits are edible and used as desert. Ripe fruits are mixed with sugar and chilli peppers, wrapped in thin plastic sheet and are sold in shops in markets, at railway and bus stations as well as at many tourist centres in southern Thailand. Ripe fruits are also dried in the sun for few days. 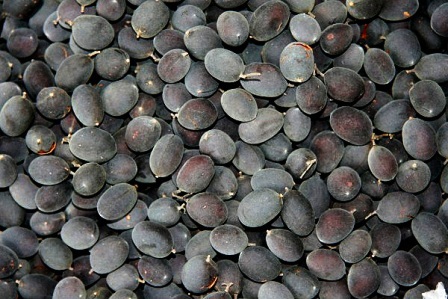 The pulp is then separated from the shell and sold in the market alongwith the seeds. Deshelled ripe fruits are also coated with sugar or a mixture of sugar, chilli and other ingredients, depending on individual techniques. These coated fruits are sold in the market. The wood of a luk yee tree is very hard and compact. It is therefore highly valued. The main problem for expanding the plantation of this fruit tree is its long juvenile period. Many local farmers say that it takes 15-17 years, sometimes even more to come into bearing. 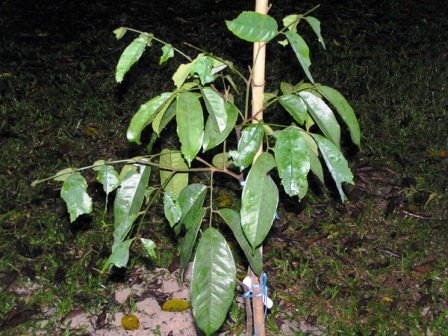 However, it has also been observed that if the tree is looked after well, the juvenile period gets reduced. Luk yee can be propagated by seed. Luk yee deserves to be promoted as a commercial fruit as its pulp has a value for processing. The products are already popular with local as well as visiting people. The processing techniques should therefore be further developed and the products should be further promoted. The most discouraging factor standing in way of developing luk yee as a commercial crop is the too many years taken in coming into bearing. But some solution to this problem can be found by raising the trees by vegetative means, developing of some precocity inducing cultural practices, use of growth retardants etc.